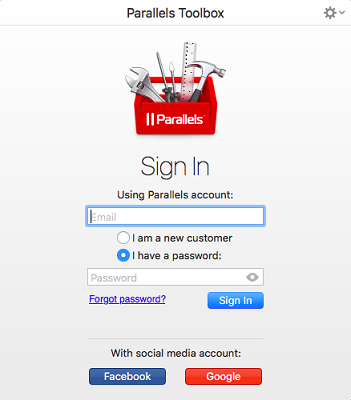 How to activate a Parallels Toolbox for Mac trial period? Start Parallels Toolbox. You will see the registration window. You should either sign in to your existing account or create a new one. After you sign in or create an account, you will see the Try or Buy window. Click on Try Free for 7 days. 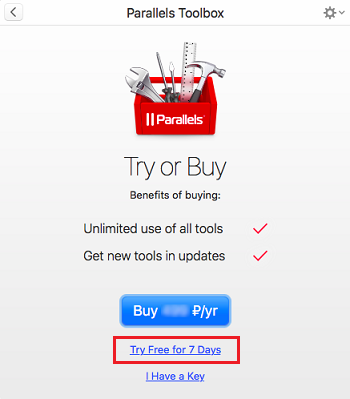 Your copy of Parallels Toolbox will be activated for 7 days. You can purchase the full version at any time during your trial period and reactivate your copy with it. Open Parallels Toolbox and click on Buy to make a purchase, or click on I Have a Key if you have already purchased a license.